Note: Packaging has been updated. When it comes to kids, it can be tricky finding the right sunscreen. Ideally, it would be a gentle, no-tear formula suitable for sensitive skin. That may be difficult to find in a conventional sunscreen. 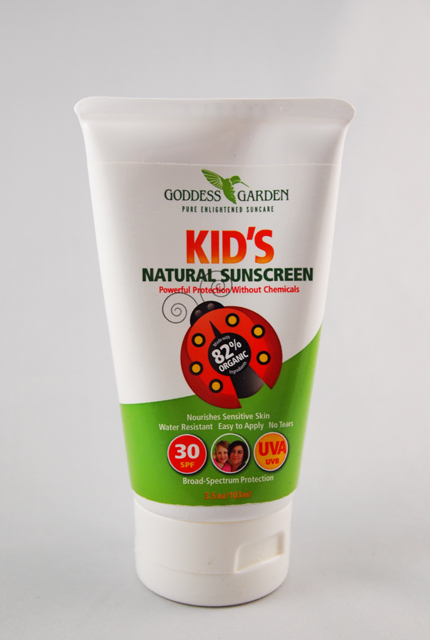 Fortunately, Goddess Garden makes a Kids Natural Sunscreen in a variety of applicators suitable for even sensitive skin. This sunscreen is available as a lotion, a spray, and a continuous spray. I was sent the lotion and the spray for review. The lotion is similar to a conventional sunscreen, with a non-greasy texture. The spray was more of a squirt bottle, but I suspect the application is more even with the newer, continuous spray design. The lotion itself is very gentle, rating a low 2 on EWG's Skin Deep scale. It is biodegradable and reef safe, but should be reapplied every 90 minutes. If you're looking for a gentle sunscreen for your young ones, this is a safe and reliable option. Also available on Amazon.com: spray and lotion.